What a glorious Hawaiian day. As preparations were being made for the Celebration of Life of Herb Weatherwax, there was a light sprinkling of rain, a light mist of liquid sunshine, which we all knew was our beloved Uncle Herb showering us with his blessings. With the passing of Herb Weatherwax on Dec. 12, 2016, we lost a Pearl Harbor survivor, but more importantly, we lost a treasure of a man. A gracious and elegant man, who always had a smile and gave the best hugs. 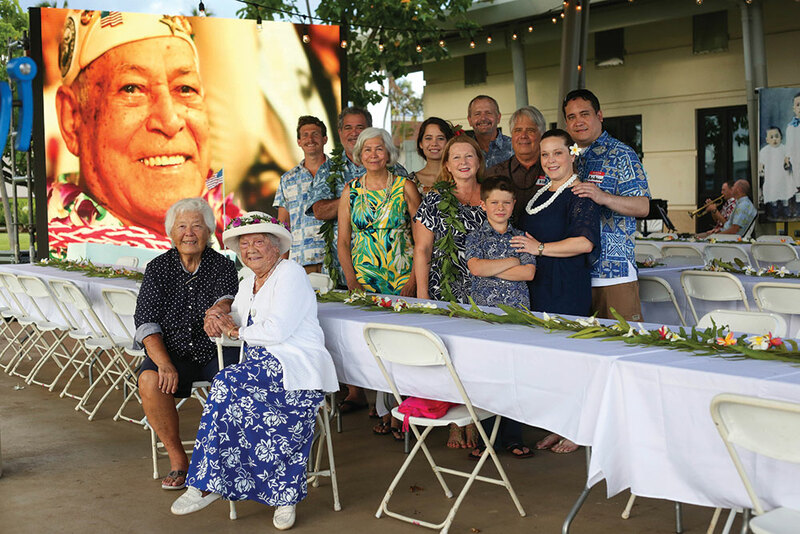 About 350 family members and friends, whose lives were touched by Uncle Herb, gathered to celebrate his life on what would have been his 100th birthday on June 3, 2017. 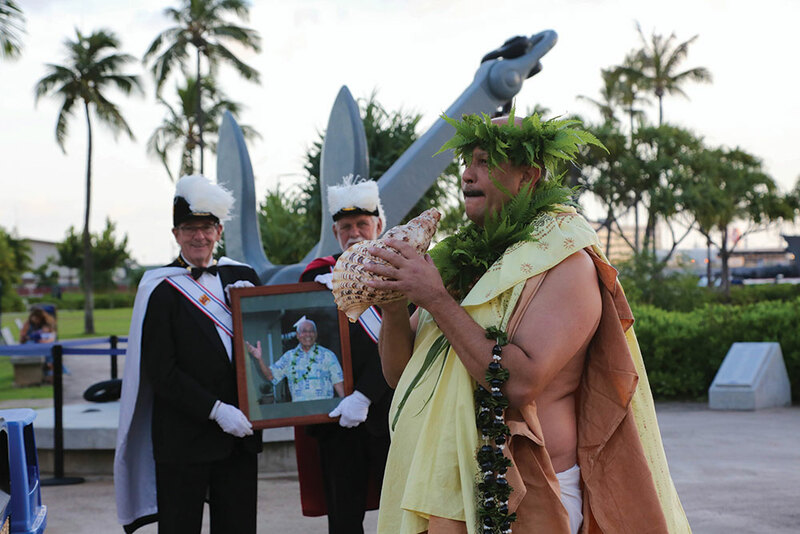 In grand procession, led by Kahu Loko‘olu, with the blowing of the conch shell and chanting of the oli, the Knights of Columbus carried in a portrait of the ever-smiling Uncle Herb, which was followed with the recitation of Herb’s genealogy. Grandson Mac and granddaughter Laie kept the evening alive as they shared many stories of their papa. 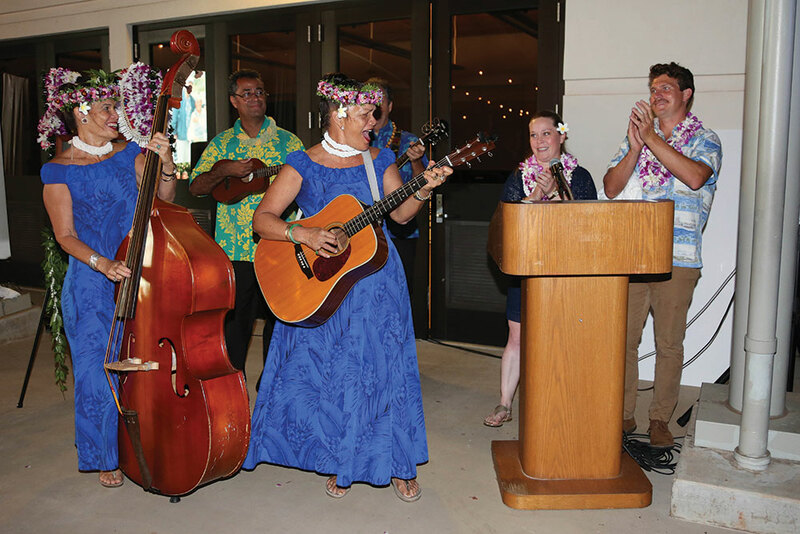 It was an evening filled with so much love, laughter, and lots of music and hula. It was truly a celebration of the life of such a remarkable man. 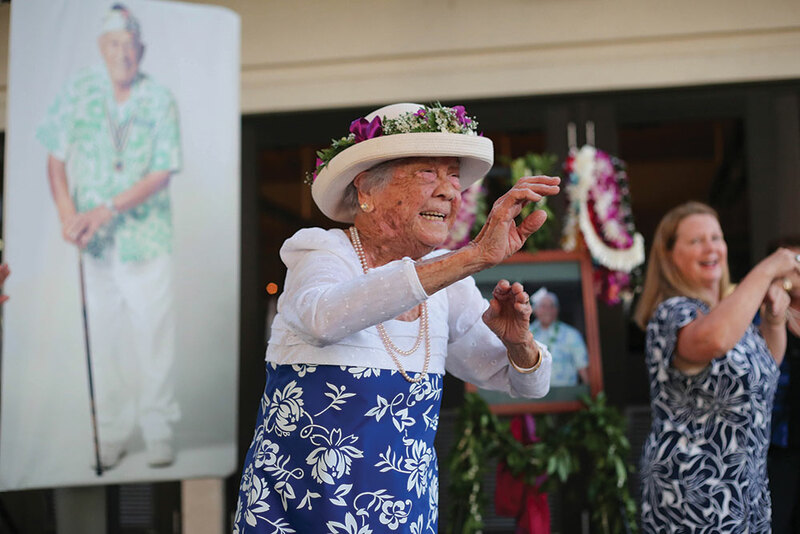 Uncle Herb’s widow, Lehua Weatherwax, dances the hula in his honor. Herb Weatherwax was a humble and selfless man. He had a heart of gold and loved to share his stories with the many visitors he met while volunteering at the Pearl Harbor Visitor Center. He loved to “talk story” with visitors, sharing his personal interpretation of the events surrounding the Pearl Harbor attack. He always felt that “it is up to survivors to perpetuate the history until we are gone. I am always learning from others and thought that someone might pick up one or two little things from what I have gone through.” His last wish would be working at Pearl Harbor as a volunteer forever. We have been blessed to have had Uncle Herb in our lives.